In this Sept. 5, 2017 file photo, William Lai, 57, speaks to media after being appointed as the new premier, in Taipei, Taiwan. William Lai is seen as a supporter of Taiwanese independence. His candidacy is a stunning challenge to the more centrist Tsai administration and its largely popular cross-strait policy. Taiwan’s former premier sent shockwaves through the country’s upcoming presidential race when he announced on Monday he would challenge President Tsai Ing-wen in the Democratic Progressive Party (DPP) primary. Lai, who stepped down as premier in January after the party’s brutal November regional election losses, said he wants the DPP to decide on its future through a democratic process. Several high-profile DPP figures, including the mayors of several large cities and a prominent independence advocate, quickly backed Tsai and have called for stability within the party. 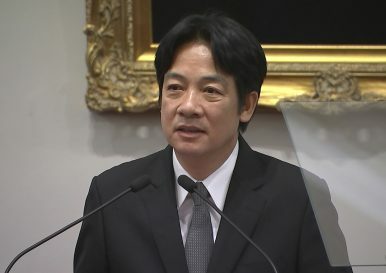 Lai has called himself “a political worker for Taiwanese independence,” although he maintains that he believes Taiwan is already an independent, sovereign nation. Nevertheless, his candidacy is seen as an attempt to challenge Tsai’s management of the cross-strait status quo, which the DPP’s pro-independence wing has long seen as ineffectual. The DPP will attempt to choose its candidate through inter-party negotiations to be held in late March or early April, DPP chairman Cho Jung-tai said Wednesday. Should these negotiations fail, the party will choose its candidate through an opinion poll. Tsai announced her own bid for re-election in a February interview with CNN. While her popularity spiked following her response to a January speech by Chinese leader Xi Jinping on Taiwan, her overall approval ratings have remained low. Lai has polled ahead of Tsai in multiple surveys gauging the popularity of prospective candidates, although opinion polls are notoriously unreliable in Taiwan. Both Tsai and Lai trail potential Kuomintang (KMT) candidates such as Kaohsiung Mayor Han Kuo-yu and former New Taipei Mayor Eric Chu, along with independent Taipei Mayor Ko Wen-je, who is expected to be mulling a presidential bid. Lai has yet to secure high-profile DPP support from outside his local base in Tainan, the southern city where he served as mayor from 2010 to 2017. On Tuesday, over 34 DPP lawmakers signed a letter in support of Tsai’s re-election bid. Taoyuan Mayor Cheng Wen-tsan, Keelung Mayor Lin Yu-chang, and Hsinchu Mayor Lin Chin-chien have all signaled their support of Tsai, as have officials within the Tsai administration including Su Beng, a prominent independence advocate and a senior adviser to the president. Questions surround Lai’s ultimate motive in announcing a candidacy that appears to be a longshot. Lai had been seen as a potential vice president on a Tsai-Lai unity ticket that would bring together Tsai’s centrist supporters and the “deep green” wing of the DPP, which prefers a clearer stance on Taiwan’s independence. Xi Jinping’s January 2 speech, in which he refused to rule out the use of force in an attempt to assert Chinese sovereignty over Taiwan, galvanized a party that was searching for identity after losing key regional seats to the KMT in November’s elections. Tsai earned immediate domestic and international plaudits for her response. However, just one day after the speech, a coalition of influential DPP leaders called on Tsai to step aside in the 2020 presidential election, saying the election results had left Taiwan “defenseless” to Chinese infiltration. Tsai’s decision to publicly announce her re-election bid had suggested she had secured the full support of her party, making Lai’s entrance into the race especially stunning. Lai has revealed little in terms of how he plans to differentiate himself from Tsai from a policy standpoint. In his Monday announcement, he made a point of promising to pardon former President Chen Shui-bian, whose second presidential term was mired by a corruption scandal. Tsai has refused to pardon Chen, who maintains a devoted following but whose approval ratings as president tumbled to as low as 5.8 percent. Lai has promised to support Tsai should she emerge victorious in the DPP primary, which officially kicked off this week. He stressed during a Tuesday appearance that the primary should allow the DPP to determine its policy road map for the future. The Tsai administration has been criticized for domestic policy failures, such as a difficult push for pension reform and a failure to significantly raise the minimum wage. It remains to be seen whether Lai, who served as the public face of the DPP’s pension reform, will attempt to distance himself from his own role within the administration. Lai’s candidacy could also be an attempt by the former premier and his allies in the party’s “deep green” wing to clarify the party’s platform ahead of Tsai’s re-election bid. However, reports from Taiwanese media have indicated that Lai is not in contact with his traditional national allies within the party. Lai’s announcement raised eyebrows among Taiwan watchers in the United States, which has largely supported the Tsai administration’s management of cross-strait relations. While tensions between Taiwan and China have risen, the two parties have stayed away from the brink of conflict despite Beijing’s refusal to hold talks with the DPP since it swept back into power in 2016 following the eight-year term of former KMT President Ma Ying-jeou. Most Taiwanese continue to support maintaining the cross-strait status quo, according to a series of polls conducted in August by National Chengchi University. On Tuesday, Taiwan and the United States announced they would establish an annual dialogue on democratic governance in the Asia-Pacific. The first dialogue is set to be held in Taipei in September, according to Brent Christensen, director of the American Institute in Taiwan, the de facto U.S. representative office in Taipei. Next month, Taiwan and the U.S. are set to observe the 40th anniversary of the Taiwan Relations Act (TRA), which has served as a foundation for unofficial ties between the two governments since it became U.S. law in April 1979. Taiwan’s upholding of the cross-strait status quo in the face of Chinese provocation has been crucial to the success of the TRA. U.S. leaders will surely watch to see whether Lai’s entrance into the DPP race causes the party to lurch toward its traditional pro-independence roots – an outcome Washington does not favor.